Are you looking for a toy that will keep kids of all ages entertained? How about a toy that requires no batteries and is inexpensive? 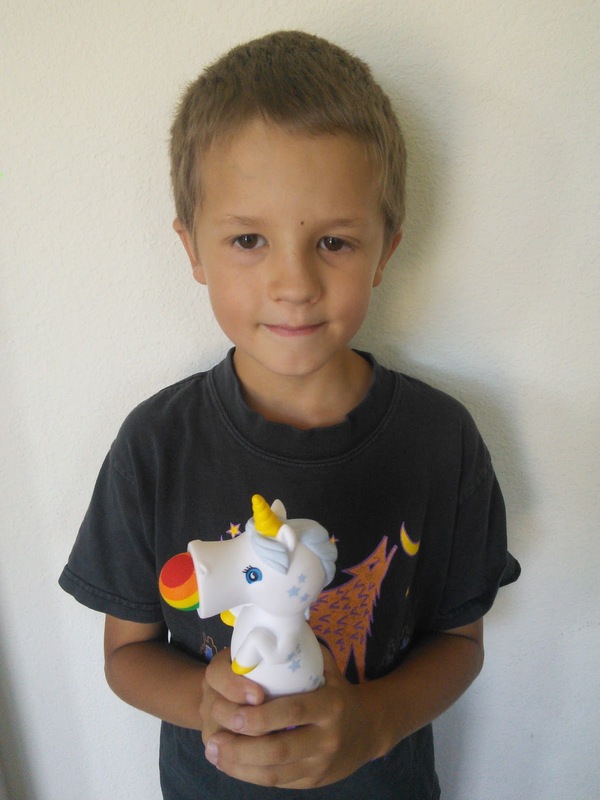 The Unicorn Popper is a toy that keeps kids of all ages happy. My three boys, ages 7,8, and 15 just love playing with the Unicorn Popper. This toy even entertains my husband. I love that this toy is safe for indoor and outdoor play. 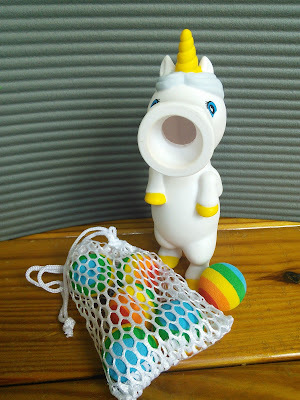 Hog Wild has made a toy that shoots out rainbow colored soft foam balls. 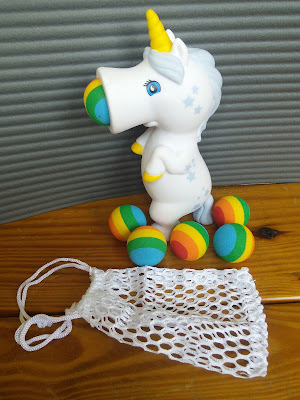 The Unicorn Popper shoots out these balls up to 20 feet. The best thing is these balls won't hurt anyone. This toy is powered by air and requires no batteries. The child places the foam ball into the unicorns mouth and squeezes the belly of the unicorn and out pops the ball. The toy comes with six balls so the fun lasts for a long time. This toy comes with a great price too which makes it great gift for a birthday. The toy fits perfectly in a stocking making it great for Christmas. The Unicorn Popper is sold in many stores like Bed Bath and Beyond. To locate a store that carries this fun toy, check out the Store Locator. You can even buy the cute Unicorn Popper online too. Just click on the below link to purchase. Do you want to see the toy in action? Then click on the below link to watch a video. 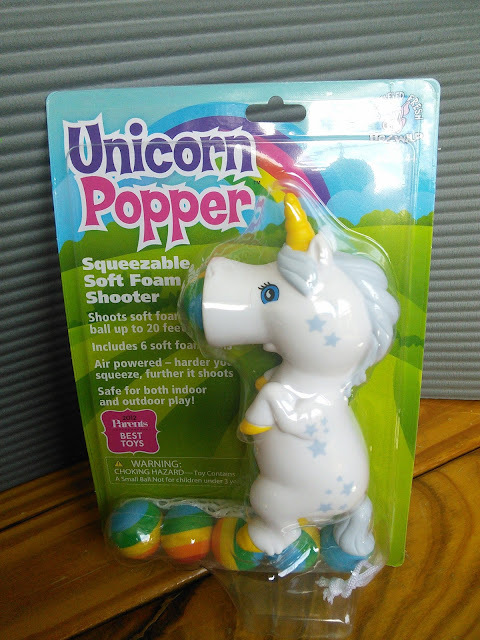 So start your holiday shopping early and buy several of these Unicorn Poppers. These are great to have on hand for last minute birthday gifts. They also great for gift exchanges. Who would you buy a Unicorn Popper for? That is super cute. My boys would have a blast with that. My boys would love this. You son is adorable! I'll have to get each of my boys one of these toys. Awww hahaha that looks so cute!! Now that is very cute! Wondering whether my granddaughter would be into it...? She's a toyboy though so maybe I will check it out. The twins are crazy about unicorns these days. This would be awesome. Thanks for sharing! Oh my gosh, this is so cute and looks fun! My kids would play with this all day long. I'm going to see if our store has one. This is too cute! I see hours of fun being had with this toy. My daughter would love it! Love this, So cool not a high tech thing can be so much fun. OMG it sounds so cute. I want to purchase one for the kids I babysit. It would be so fun to play with :) They'd love it! The way it comes out of the snout is just cracking me up completely! Definitely a cute gift idea! That works like the pea shooter from Plants Versus Zombies, except it's way more cuter! My kids would have too much fun with this. I would like to thank you for the efforts you have made in writing this blog. Very Informative post with Images. very interesting topic regarding Unicorn Gifts for Kids.